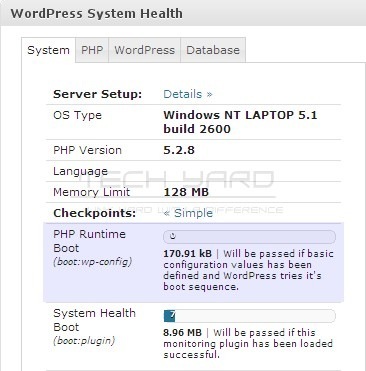 This is generally the admin’s work, but your the admin of your blog and you need to have some technical knowledge about your server’s setup, so here’s a wordpress plugin called WP System Health that show you all the info you need to know about your webserver and your wordpress database setup and performance. and has a tabbed interface widget,but some information is not available like the PHP Runtime Boot under Checkpoints in System Tab, which requires manual editing of the wp-config.php file of your wordpress installation. 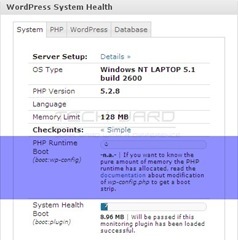 Here’s what’s needs to be edited for getting that info.Open wp-config.php file in your WP Installation folder, in the last where WordPress absolute path to the WordPress directory is set insert this line. 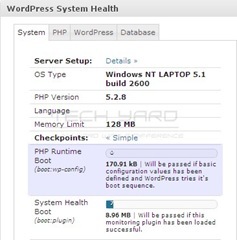 The plugins is simple it just shows you information, it does not have any admin page for the plugin.Simply upload the plugin and activate and you can see your WP Blog’s health right in your WP Dashboard as a Widget. Web browsers IE7 | FireFox 2.0.0.16 | Opera 9.27 | Safari (Windows) 3.1.2 | Google Chrome.